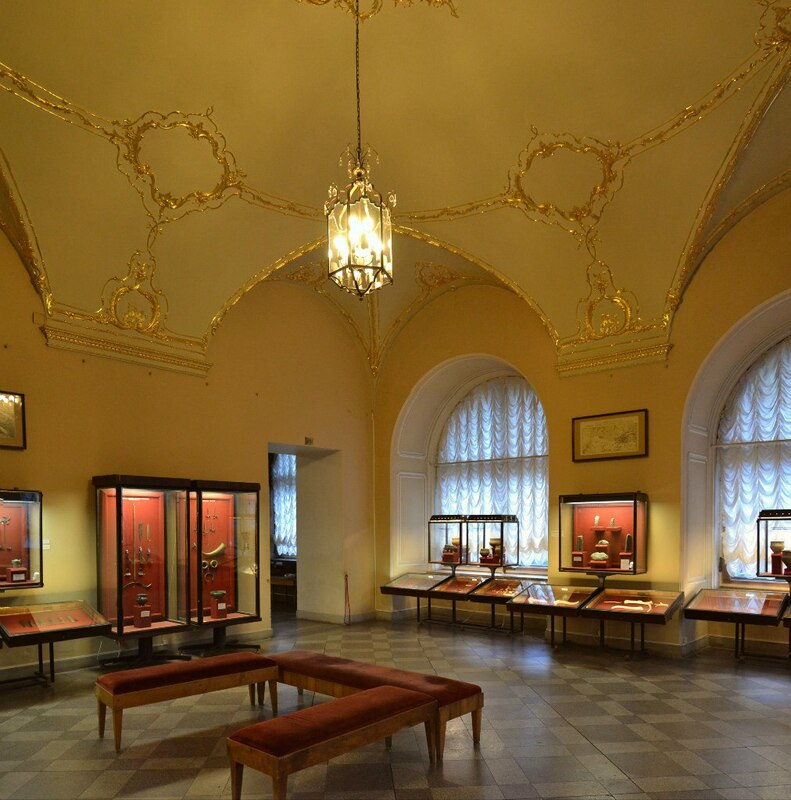 Winter Palace Research : The Artist Who Lived in the Children’s Rooms on the 1st Floor of the Winter Palace! The Artist Who Lived in the Children’s Rooms on the 1st Floor of the Winter Palace! 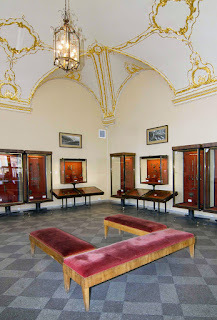 After the fire in December 1837, the apartment of Grand Duchesses Olga and Alexandra, the younger daughters of Nicholas I, were located on the 1st floor in the northwestern corner of the Winter Palace and called the 4th Spare. 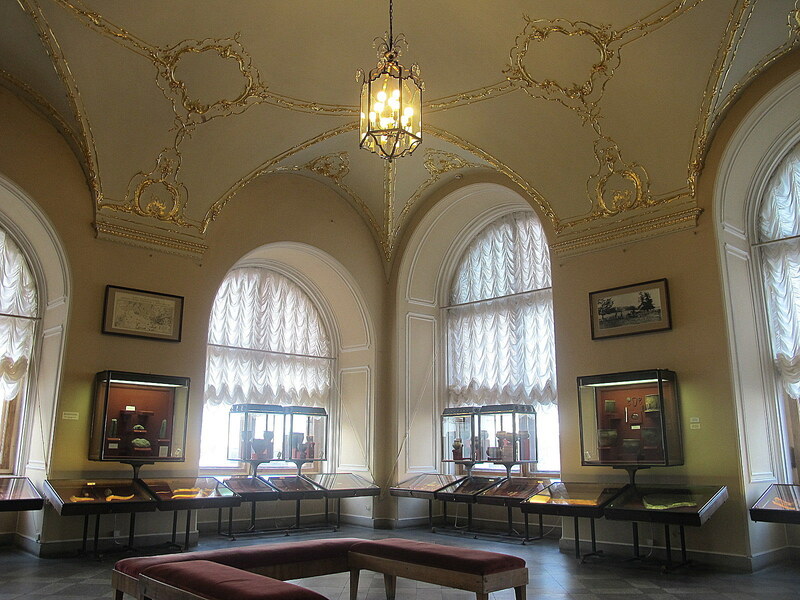 Grand Duchess Olga’s Study was the corner room with two windows facing the Neva and two windows the Admiralty. She wrote in her 1883 memoir that it was ‘very big and not very warm’. 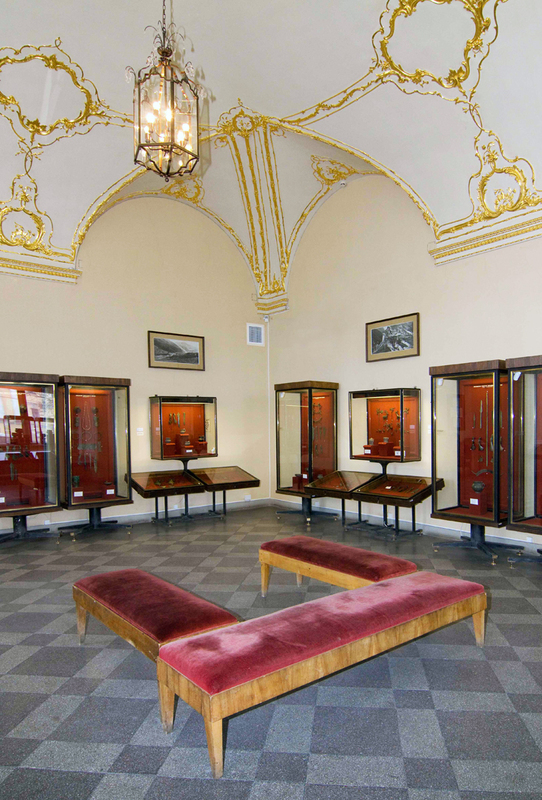 In February 1841, the family had to move back to the Anichkov Palace due to Olga’s severe lung illness from the dry air in her rooms. When Olga married in 1846 and left for Stuttgart, she was presented with an album of watercolors of her rooms. In the winter of 1851-52, Nicholas and Olga, the children of Grand Duke Konstatin, lived here under the care of their grandparents while their parents were in Venice. Later in 1852, Luigi Premazzi was given permission to stay in the 4th Spare while he was painting the interiors of the Winter Palace. 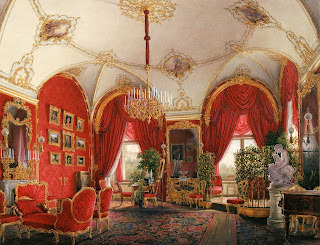 His watercolor of the study shows the changes in the six years; red curtains, multi-flowered carpet. 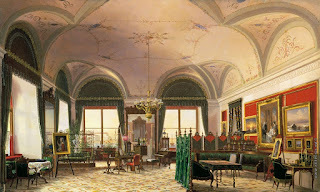 The 4th Spare apartment was redecorated in November 1855 by Stackenschneider for Grand Duke Nicholas after his marriage on January 25th, 1856 until his palace was built. 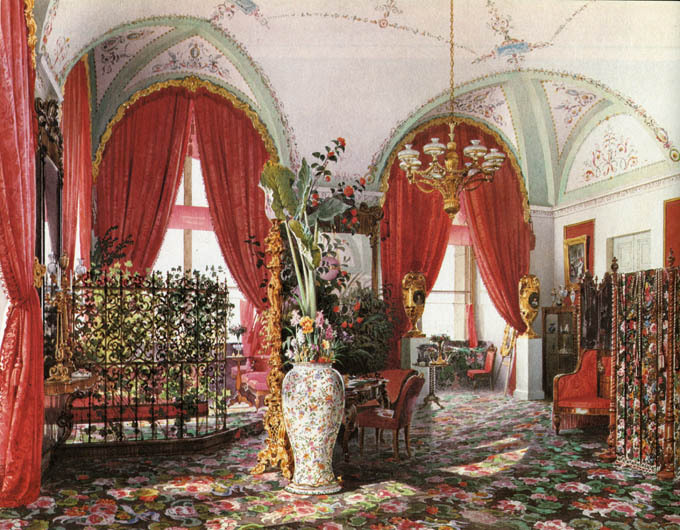 In 1896, the 4th Spare was decorated as the nursery for the children of Nicholas II and Alexandra. M. Eagar wrote the former Study was their living room and decorated in blue; walls of cornflower patterned chintz and blue velvet pile carpet. It was quite interesting to see changes the room went through over the years, I suppose most of the rooms and halls went through a few changes but is there any that have remained the same from its completion to today? 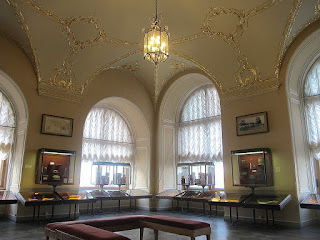 I love that the Hermitage has restored the ceiling, what a fantastic job they have done! I found a website the other day which was about the restoration of the flooring in some of the rooms, it was rather interesting to read about. Brilliant photos by the way, the virtual Hermitage visit didn't give me the crystal clear images as your camera has done when I took a screen shot of it. What's it like to stand in the rooms? do they feel big? are they big? 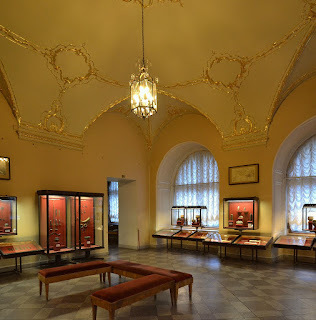 The virtual visit (which makes me feel very dizzy after I've been there) on the Hermitage website doesn't have what looks like velvet clad benches in the room, everything else is the same as in your photos. Thanks so much Ghostie! You have given me a wonderful idea for a post! Ooooo intriguing, can't wait to see what it will be! I am not the only one!